From left: Madelyn Gallagher, Award of Excellence; Evan Pickering, Award of Excellence; Savannah Samplinski, Award of Merit. 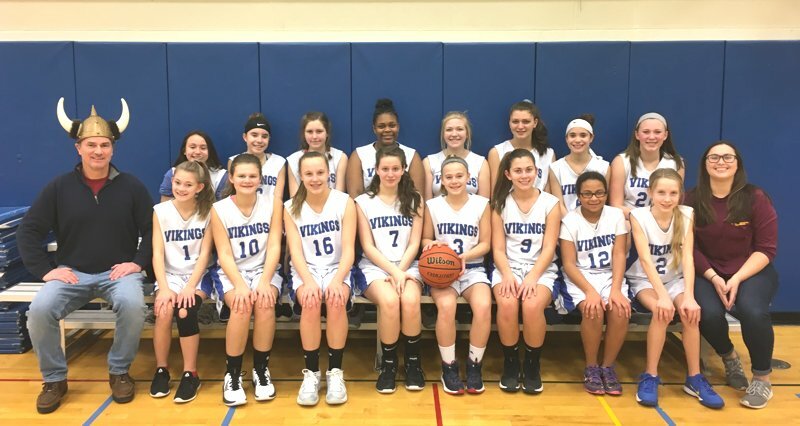 The 2019 girls' modified basketball season was a tremendous success, albeit not necessarily in the won-loss column (the girls were 8-6 on the season good for a bronze medal in the NFL). That being said, the girls improved by leaps and bounds over the past few months and many are ready for their upcoming JV season later this year. The seventh graders were a fist of five and earned their own battle scars in their first official campaign. Assistant captain Madelyn Montes showed great promise early in the season, but an unfortunate wrist injury cut short her game exposure. To her credit, Madelyn worked hard to heal and returned for the last two games. 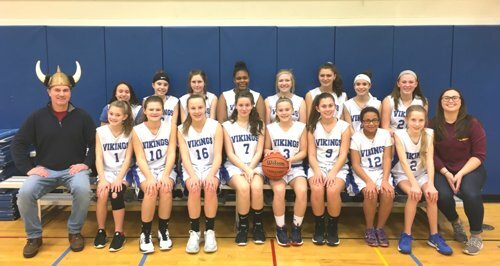 Ella Steinwandel, Rachel Joseph, and Charlotte Steck were three solid seventh grade guards that truly came to life as the season moved along. "RJ" proved to have a very reliable jump shot from the field. Ella led all seventh graders in going to the charity stripe because of her interest in driving the lane. Steck's work ethic was unparalleled as she was in the gym, first to practice, almost every day - working on her game as the others filed out of the locker room. In games, her shut-down defense only grew as the season moved along. And finally, Ta'Miah Wilkes - Ta'Miah will be a force down on the block in the years to come. Ta'Miah played hard at both ends of the court and has a soft touch off the glass. The eighth graders made up the bulk of the squad and are ready to go to JV! There were five veterans and six rookies among them. New to the team (and the school!) is Alexis Neal. Alexis played post and did a solid job learning her plays and her teammates! Another rookie forward was Miranda DeCourcey, who fought hard and also had a very nice understanding of how the backboard worked. Kayleigh Vanderzell was a bit of a tweener; she was listed as a forward, but mostly played at a guard position. Kayleigh scored most of her points in the difficult mid-range jumper area. Speaking of guards, identical twins Alena and Gia Panepinto gave fits to other teams as they buzzed around the court with an almost telepathic knowledge of where the other sister was. Statistically they scored almost 10% of our total season's points. Our final eighth grade rookie was Ella Rudney. Ella missed three games due to an injury, which kept her from joining the storied annals of the Viking Centurions (100 points for a season - list upon request), but she still put up 84. Ella also led the team in fouls with 35, but to quote her, "Hey, I only fouled out of two games". Ella is a gamer who only looks in the mirror when things do not go well for the team. Ella was the MVP for the season and deservedly so. And finally, our five returners. Samantha Buckingham made all 14 games (not easy with our flu season) and grew as a defender. Samantha was presented with a challenge as a defender and rose to that challenge. At the post was Serenity Sikora, who was second on the team in scoring with 53. Besides the close ones and the put backs, Serenity also had an accurate shot from the elbow. Gabi Vecio was a very solid guard who often drove the lane using either hand - something practced by all but only game used by Gabi. Her efforts in the Niagara Wheatfield game were something to behold - she was a true warrior. Guard Lily Koslowski was a crowd favorite - hitting the trey four times during the season. Lily is a good passer and a team leader. She is supportive of all and plays her heart out - she will truly be missed. And finally, Captain Jenna Hoy. Jenna led the team in playing time and charity stripe visits. Jenna served as a point guard because the team needed it and she was an important piece to the Viking puzzle this year. She was a strong rebounder and she will play an important role with JV next year. Many thanks for a wonderful season made possible by players, parents, fans, the scorekeeper who shall remain nameless, and Assistant Coach Kate Boutet Go girls! The work of 20 Veronica Connor Middle School students can currently be seen in the Community Meeting Room of the Grand Island Public Library during regular library hours. The show celebrates the talents of middle school students and highlights the learning taking place through the visual arts at the school. Work in a wide variety of visual media, display the ways in which students use art as a language, reacting and engaging with the world around them. Pastel paintings, self-portraits in a wide variety of media and landscapes are among the works featured. The display is an annual undertaking for students at VCMS, in honor of Youth In Art Month. 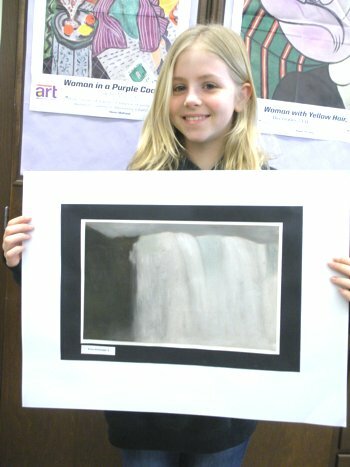 The annual observance began nationwide in 1961 as a collaborative effort between the Art and Craft Materials Institute, the National Art Education Association and the Council for Art Education in order to emphasize and make known the value of art education for all students and to support quality art programs within the nation’s schools. Students at Connor Middle School join thousands of other students across the US in participating in activities to mark the occasion. Among its many goals, Youth In Art Month seeks to direct attention to the value of art education as an important component of the total student experience and educational curricula within schools. Recognizing that art education fosters understanding which helps develop citizens of a global society, Youth In Art Month seeks to make communities aware of the divergent and critical thinking skills inherent in art-based learning. Student participants; all grade 8: Julia Capage, Berin Celik, Kaylee Click, Lauren Coombs, Natalyn Cordero, Riley Crosby, Miranda DeCourcey, Caitlin Fay, Aubrey Frank, Samantha Klein, Kendyll Mack, Maria Novelli, Megan Pinzel, Jada Rastelli, Wynonna Roberts, Saleh Saleh, Alexis Schad, Emma Schinnagel, Annabella Tippett, Riley Chen, Erica Marshall and Erick Wittmann. The Grand Island Community is cordially invited to view the students’ work which will remain on display throughout the month of March. Samantha Buckingham, Berin Celik, Joseph Cicero, Lauren Coombs, Natalyn Cordero, Reagan Fast, Caitlin Fay, Logan Fox, Aubrey Frank, Jackson Frey, Sophia Heffley, Samuel Jayme, Eden Johnson, Julia Juntunen, Kendall Keller, Kathleen Krawczyk, Patrick Lepine, Phillip Lepine, Maia Nowak, Megan Pinzel, Matthew Rizzo, Wynonna Roberts, Emma Schinnagel, John Szczublewski, Erick Wittmann . 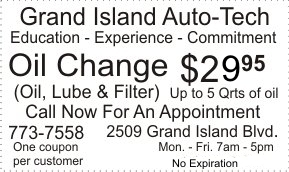 Ethan Andriaccio, Deon Barnes, Jake Benton, Max Black, Bryson Boyle, Savannah Bukowski, Brady Butler, Joshua DeLong, Teresa Dudziak, Ruairi Higman, Parker Inman, Austin Irons, Chase Judd, Jayden Kleinschmidt, Brady Maroni, Matthew Martin, Brandon McCreary, Samantha Mesmer, Brady Moran, Leah Nickerson, Charlotte Nowak, Colby Okelberry, Rylee Pachla, Jackx Pendola, Alejandro Perez, Kaitlyn Powell, Celine Rizek, Mavrick Rumsey, Scarlett Sniadecki, Kailyn Stedman-Pate, Christopher Swain, Vince Trower, Alexandra Watt, Jayce Wylke . In the Connor Middle School Family & Consumer Science Class, we use our math skills to calculate the number of "wake ups" for a career in an average person’s lifespan. Using milestone years to which our students can relate, we figure that approximately 10,000 days or more will be spent in one’s vocation. 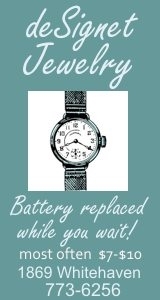 How does one get more students to spend the vast majority of those days, as Dr. Stacey Watt described in The Swing Theory as "laughing and enjoying the success of soaring above the ground" rather than just sitting and waiting for the hands of the analog clock to spin? How can the Western New York Community come together to promote Science, Technology, Engineering and Mathematics studies and careers to open up a more expansive universe of possibilities? As Amelia Earhart once stated: "The most effective way to do it, is to do it." Thanks to the tireless efforts of Grand Island Distinguished Alumni Dr. Stacey Watt, our first ever Amelia Earhart Inspiring Careers in STEM was held right here at Grand Island High School in January. A large representation of STEM related careers was heard as presenters had very inspiring messages for the educators/parents and of course, students in attendance. Wishing to share the evening with ALL seventh graders, including those that could not be there, career essays were written that culminated the Family and Consumer Science Career Exploration Unit. Quotes from: UB Assistant Professor Christine Schaner Tooley, UB Engineering Student Olivia Gustafson, MD-PhD UB Student Mary Gallo and Pilot Lisa Hotung were included in the writing pieces. (Time and space constraints prevented quoting the entire panel; there is always next year!) The finished pieces were bound and shared with Dr. Watt and her entire panel of speakers. 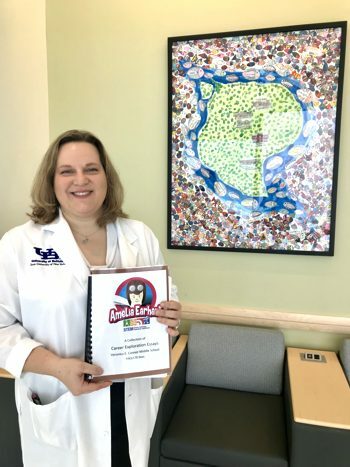 Author, Anesthesiologist and UB Medical School Anesthesiology Program Director Dr. Stacey Watt saw a need in our Grand Island community and took Amelia Earhart’s advice! 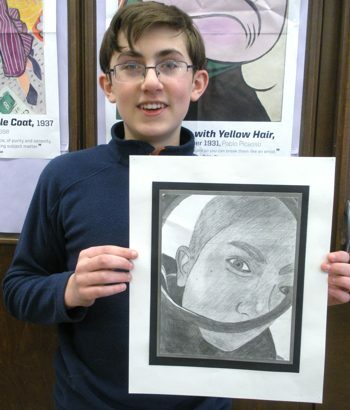 Erick Wittmann proudly displays his recently completed self-portrait, inspired by the artist M.C. Escher. 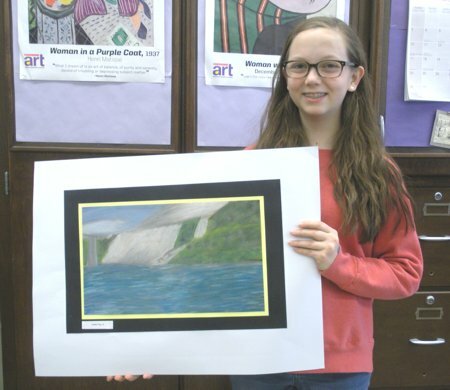 Each year, the Art Department of the Grand Island schools recognizes and celebrates many of its top artistic achievers with the “K-12 Artist of the Month” award. Presented to ten students annually, the award highlights the varied accomplishments and achievements of district students who excel artistically and who creatively solve problems by using a wide variety of media to express and find their own unique artistic voices. The student selected for February, 2019 is Erick Wittmann, an accelerated eighth grade art student currently enrolled in Studio in Art at Connor Middle School. Erick is an extremely talented young artist who meticulously applies himself fully to each and every art assignment, often doing more than is required. He strives to do his best and is adept in a wide variety of media. Art for Erick is a natural vehicle for expressing ideas and visually solving problems. 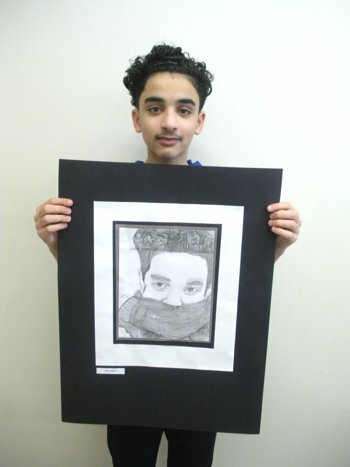 He is a well-rounded and thoughtful young artist who displays abundant creativity. His determination and sense of artistic quality sets a high bar in class. 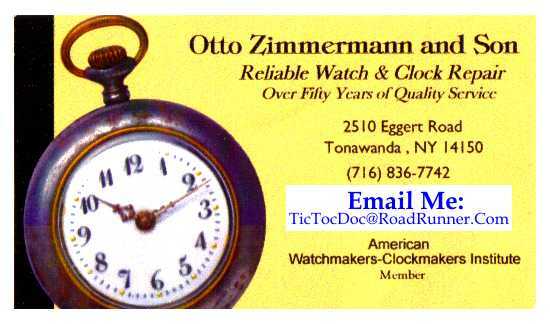 He pursues excellence and is an eager, enthusiastic learner. Erick’s art teacher cites his positive attitude and work ethic, along with his artistic ability as reasons he was selected for this award. He is a student whose abilities, artistic potential and creativity set him apart and mark him as exemplary. The art department is proud to recognize Erick as their "Artist of the Month" for February, 2019. Forty-eight VCMS students have worked on Tech War projects since October and took overall champion at the Jan. 8 competition at NCCC. Paul Emmi (left) and Joe Fatta took first-place overall in the Mousetrap car event with a distance of 109 feet. 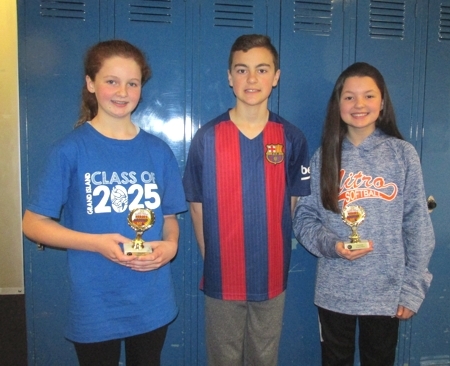 A group of 48 eighth-graders put their tech expertise on display and earned the overall Middle School championship at the annual Tech Wars at NCCC. The Veronica E. Connor Middle School group, under the guidance of technology teachers Michael Nucci and David Bowman, competed against 23 other schools and over 700 students. Once again, VCMS was declared the overall Middle School Champion, earning 16 points. The next closest competitor had nine points. Individuals earn five points for a first-place finish, three points for second and one point for third, which all go to the team total. The VCMS team has been working on their projects since late October. In the Mousetrap car event, the team of Paul Emmi and Joe Fatta raced to first-place overall with a distance of 109 feet. Maelee Roach came in a close second as her car travelled 105 feet. In the CO2 car event, all six of the cars raced their way into the top eight slots. Eden Johnson’s car blasted down the 6-foot track in .914 seconds which was good for second overall. Berin Celik’s car wasn’t far behind as she brought home a third-place finish. The combined HS/MS Bridge event boasted the largest field of 98 competitors. Kelsie Greene and Amanda Gula built their way to number three on the podium. They were the number one Middle School competitor, being beaten only by two high school groups. In the On-Site Engineering competition, students do not find out the problem they have to solve until they arrive on location. There were 17 entries in the event and VCMS students Phillip Lepine and Matthew Rebmann took second overall. Out of the 17 groups, 14 of them were high school students. From left: Sammy May, Jierui Jiao, Ms. Szczublewski, Matthew Burridge, Hayden Garey, Asher Wright, Kaitlyn Wadman, Aleksander Pyc, and Mithil Kara. 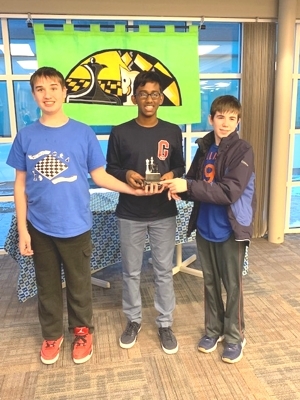 From left - (USCF Rated Team) John Paul Szczublewski, Abi Selvakumar, and Tanner Hawley. Over the last three years, the Veronica Connor Middle School Chess Club has been making a winning statement in Western New York. 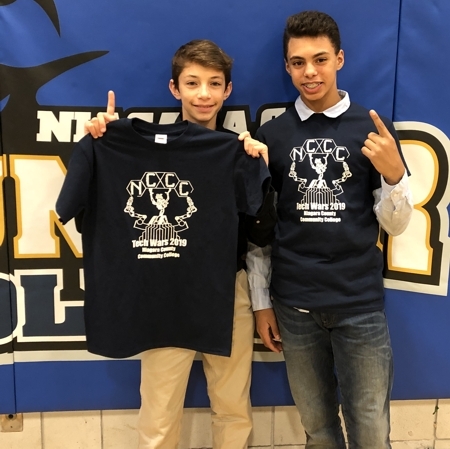 On Saturday January 12, 2019, eleven members of the Veronica Connor Middle School Chess Club were awarded the team championship as they competed in the W.N.Y. Blizzard Bowl Scholastic Team Chess Tournament held in Elma, NY. This is a repeat win as the chess players claimed the top prize last year in the Blizzard Bowl Tournament. Since the club's inception in 2016, the chess players have entered many tournaments as individual players with many individual place finishes. However, over the last two years the chess players have entered four team tournaments and have taken the top spot twice and claimed third place in two other team events. 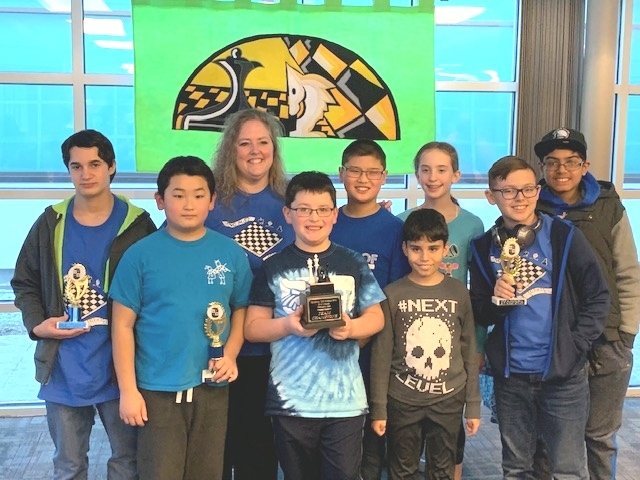 Chess Club Advisor, Ms. Susan Szczublewski, credits the club's overall success to the students' enthusiasm and desire to improve each and every week. Currently, the club boasts over 40 students. Congratulations goes out to: Jierui Jiao, Aleksander Pyc, Sammy May, Kaitlyn Wadman, Asher Wright, Matthew Burridge, Mithil Kara, and Hayden Garey who took 1st place Saturday in the unrated division against 8 other area schools. Special congratulations goes out to: Tanner Hawley, Abi Selvakumar, and John Paul Szczublewski who tied for 2nd and 3rd place in the USCF rated division where 16 other schools competed in their division. Six of our players also captured individual trophies for their fantastic chess performances. On Saturday February 9, 2019, Veronica Connor Middle School will host the Valentine's Scholastic Chess Tournament at Grand Island High School.